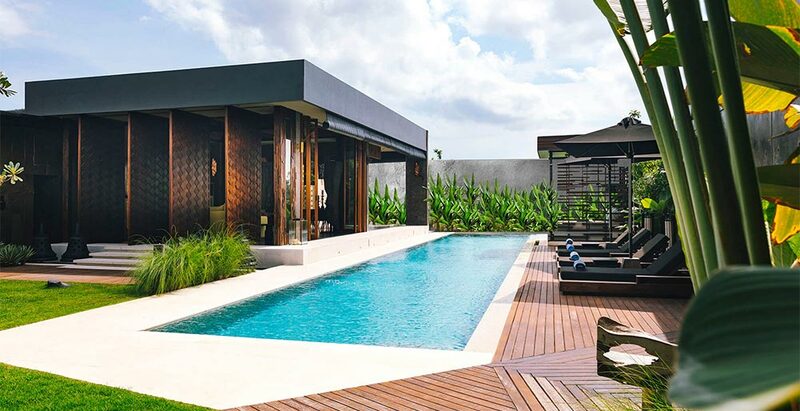 This four-bedroom, fully staffed luxury villa in Canggu is perfect for families and groups of friends. The villa’s edgy architecture, large rooftop terrace, 25-metre pool and tropical garden, along with its beautifully designed interior, purpose-built karaoke room and friendly staff, make it an absolute gem. It’s located in a quiet corner of super trendy Batu Bolong – the beating heart of Bali’s healthy-living and eco-conscious movement by day and hipster party scene by night. If you’re looking for a super stylish oasis to explore Bali from, then we can’t think of a better place.